A leaking flat roof is a common problem. You may see damp patches, staining, or flaking paint, on the ceiling below. You will need to examine the roof to see where the water is coming in. 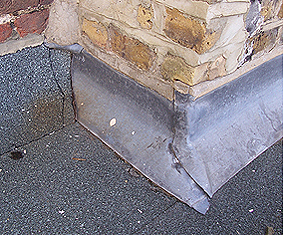 Check for any cracks or tears in the roofing felt, or bitumen. These can be repaired with special roof sealant products. Your local DIY store will stock these. It's often a two part process. First you fill the gaps/ cracks with a thick tar like flexible filler from a tin. Then paint over the whole area in need of attention or indeed the whole roof with a rubberised topcoat. Lead Flashing is an excellent product used in many roofing/waterproofing applications. It comes in strips on a roll of varying widths. Lead flashing products are mainly used to provide a waterproof covering to the edeges around flat roofs, down the sides of sloping tiled roofs, parapets and some gutters. Lead is a very soft metal so it ideal to form around angled and curved surfaces. It doesn't corode like steel and if well installed may well last the life of the building. Check that the brickwork around the roof is sound and the pointing is in good condition. 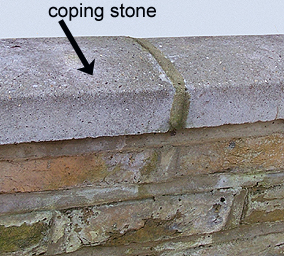 If there are concrete capping stones check that these are not loose and are well pointed. If you see any moss or plants growing out then they probably need attention. Scrape it all off and check the mortar is sound. NB WARNING Working at heights can be dangerous. You must ensure that you use appropriate access equipment. It is your responsibility to ensure your own safety.